This fragment comprises a solid, curved block with a gadroon enrichment on the vertical curve of the outer surface. In the intervals at the top of this carving appear small flowers, and above there is a cavetto which leads to the thin and now broken fillet surface at the joint. The identification of this peculiar marble is made certain by the small flowers in the enrichment. We have a small segment of the solid bottom of the bowl of a giant marble krater, such as the well known example in the British Museum and composed of fragments from Hadrian's Villa (Villa Adriana) at Tivoli1. Since the majority of large vases of this class come from this source we cannot err in conjecturing a like provenance for the fragment purchased by Tatham. Although there are numerous parallels for the form of curved gadrooning, only one other vase in Piranesi's plates2 shows the detail of the flowers in the upper intervals (a large cinerary vase presumably in Piranesi's own "museum" at the time). The Villa Adriana provenance is further supported by a number of parallels among vase fragments in the Antiquario of the villa (as no. 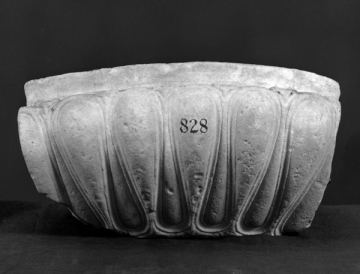 549, which also features offset moulding on the convex fluting); the presence of these little flowers in some but not all the giant Villa Adriana vases may have indicated the signature and certainly the style of one group of decorative carvers working for the villa. 1 G.B Piranesi, Vasi, candelabri, cippi, carcofagi, tripodi, lucerne, ed ornamenti antichi, fol, Rome, 1779, pls. 57, 58, (Wilton-Ely 942, 943). Rome; collected by Charles Heathcote Tatham for the architect Henry Holland during the 1790s. See Cornelius Vermeule, unpublished catalogue of the Antiquities at Sir John Soane's Museum, Introduction, transcription of Tatham letters, List 3, no.14.